The rest of the world is definitely not watching the Australian Banks. Global coal consumption has been flat for a few years, but in a new report, the IEA predicts coal use will grow again ’til 2022, at least in a subdued way. This appears to be singlehandedly due to Narenda Modi, who announced in August that the rest of India should get electricity and by next year, so 40 million households are to be connected at a cost of $2.5 billion USD. Most of the renewables above will be in the form of underwater turbines on steep slopes near large bodies of water. The other on this graph is not solar PV or tidal power, but Nuclear. Growth in coal use has flattened for the last five years, prompting decrees for the eager Guardian that it is variously in decline, at a turning point and on life support. Instead, the IEA predicts that it will pick up again. The situation as it was from 1971 – 2015. IEA Key Energy Statistics 2017, page 38. 4: Other includes heat, solar thermal, and geothermal. Still a fossil fuel powered world. Coal is just one of three major fossil fuels, but the one with the largest proven reserves. There are sufficient proven reserves of coal to maintain current consumption for around 115 years, and far more awaiting to be proven. There are “only” 50+ years of oil and 50 years of gas. Shutting down coal production in Australia and the USA – or for that matter all fossil fuel production in all OECD countries will not constrain supply, though will push up prices to the benefit of suppliers elsewhere. In terms of constraining emissions to stop the fictional 2°C of warming, would require around 75% of proven reserves being left in the ground. I have produced a graphic of where the major reserves are located, in terms of emissions. 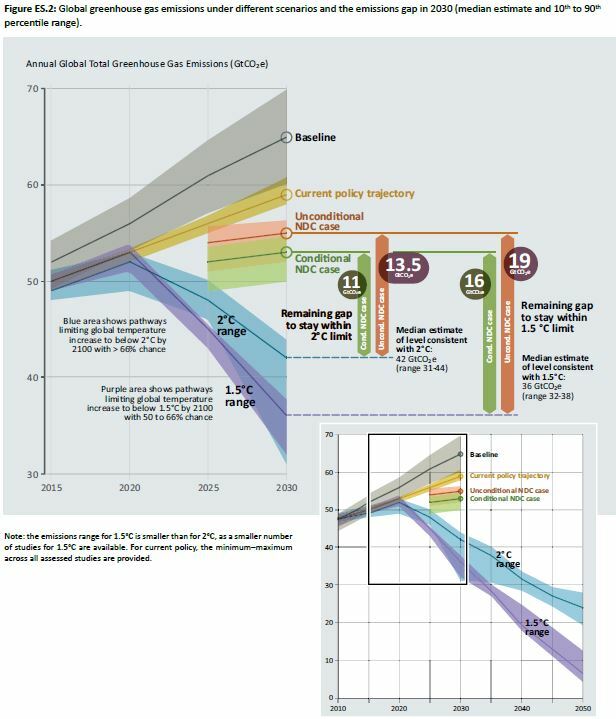 Bear in mind that just 800 GtCO2e is required to break the dreaded 2°C threshold of climate doom. Is the UNFCCC seriously going to get Russia, China, Saudi Arabia, Iran, India, Indonesia and Venezuela to commit to removing a major component of their National Incomes in less than a generation? This goes largely unmentioned to the annual COP meetings. It is all about reducing demand. And then there are the unproven, but likely reserves of fossil fuels. These could be 3 to over 15 times the proven reserves. More details at my recent post The Supply-Side of Climate Mitigation is Toothless. Only the greenists seem to like playing hopscotch within a minefield it seems…..problem is, they shoved our economy in for the first run…. If people want to be an activist, it seems energy protection would be the way to go. The climate activists are at their core authoritarian socialists. They have no real interest in controlling global greenhouse gas emissions, just destroying private business and replacing it with state control, planned according to their baseless moral precepts. The emptiness of their mitigation policy justifications nicely mirrors the emptiness of the case for CAGW. …planned according to their baseless moral precepts. The emptiness of their mitigation policy justifications nicely mirrors the emptiness of the case for CAGW. A high UN official has admitted the real reason for the climate hysteria: to transform the world economy, redistributing income from rich nations to poorer ones. Christiana Figueres, the Executive Secretary of the United Nations Framework Convention on Climate Change (UNFCCC), warned that the fight against climate change is a process and that the sought-after transformation of the world economy will not be decided at one conference or in one agreement. It’s a brave person to predict 50 years of oil and gas. After all, we were supposed to hit Peak Zook in the 70’s, then the 90’s, then the 2000’s and we still getting better and better at extracting oil and gas and finding new reserves. It would be interesting to see a graph on the changes of energy use over several decades. Coal use is declining in the US, but it’s being replaced by gas, not renewables. Methane can be manufactured using CO2 and hydrogen. Most of the hydrocarbons can be manufactured. No supply problem. Only price. Methane can be manufactured using just about any carbon feedstock and a few billion microbes! The earth makes gigatonnes of the stuff without our help. Proven reserves are only vague estimates and they are increasing all the time. They are dependent on what is economically viable to produce at today’s technology. Proven reserves are being exploited at different rates. At one extreme there is Venezuela with the world’s largest proven reserves of oil, which will probably last a millennium at the current production rates in the inept Chavista socialist paradise. At the other extreme, current proven reserves of oil and gas in the USA will be exhausted in around a decade. The competitive economy of the USA is ensuring new reserves are being discovered all the time. Ten years ago, there was also a decade of proven reserves of oil and production has risen over 50% since then. Another example is for coal. For instance, under the North Sea there is estimated to be between 3 and 23 trillion tonnes of coal. Another one trillion tonnes of coal is estimated to be off the coast of Wales. Much of this will never be extracted, as there are 10-20 seams, and there is the matter of a few hundred metres of sea above the seams. But, in context, proven global coal reserves are about 0.8 trillion tonnes and the British Isles are a minute part of the planet.Yet the UNIPCC claims that burning those 800 billion tonnes is more than sufficient to generate 2C of warming. The lesson is that the IPCC cannot control global GHG emissions to the extent it desires, only ensure that people are made worse off in any country that tries to restrain its GHG emissions. Bear in mind that just 800 GtCO2e is required to break the dreaded 2°C threshold of climate doom. There is no ‘ZERO’ scientific evidence that atmospheric CO2 levels above 170ppmv can possibly affect near surface temperature in any measurable way! Kevin, What is your meaning of ‘potential emissions’? Even if your analysis of converting Coal to atmospheric CO2 were correct; Please indicate how that atmospheric change affects near surface temperatures at any, let alone all locations?? AlGore\J.Hanson started the scam with their “business plan”; the communistic Green glob took that over; then the viscious greedy Banksters grabbed that! All with absolutely no science whatsoever! Where is your science? Both theoretical economics (in which I have a degree) and in management accountancy (where I worked for 25 years) deal in “What-if” analyses. Neo-classical economics makes a series of very abstract assumptions, then works through the logic of changes in a highly formalized way. Apply the central assumptions of mainstream climate – that is IPCC AR5 – to warming and you get that around 15-20 GtCO2 of emissions will increase CO2 levels by 1ppm. Also the assumption is that a doubling of CO2 will produce 3C of warming. So a rise from 280ppm to 450ppm will produce 2C of warming. With Moving from 400 to 450ppm requires 750-1000 GtCO2 if CO2 stays in the atmosphere forever. But it does not. Now some or all these assumptions might be ridiculous. But, even if they are true, climate mitigation will still not work. The central assumptions are that (1) global GHG emissions raise global GHG levels, (2) which raises global average temperatures (3) which has highly adverse consequences on the climate. Therefore reducing global emissions to near zero over a few decades will prevent CAGW. 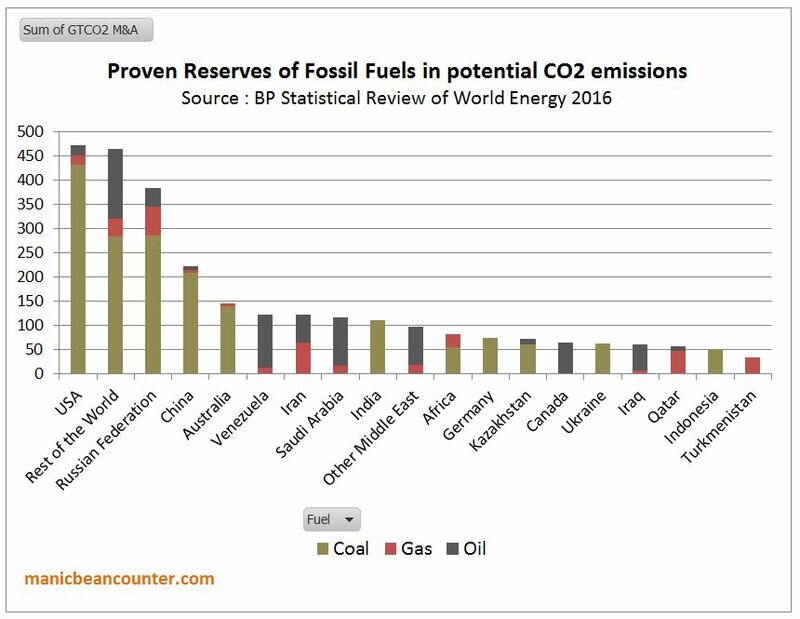 (b) Nearly all those countries with significant deposits of fossil fuels are not willing to leave the vast majority in the ground. That includes Russia and the Middle East. Why apply such assumptions when there is no scientific evidence that such assumptions can possibly apply? Why continue to promote the scam? I sometimes wonder whether the banks are really foregoing these opportunities, or are they doing so by other means that they don’t reveal. No bank or other financial institution is going to miss out on profits that are virtually guaranteed. Australian banks have a lot of institutional shareholders and they may have different ideas. The banks are controlledby the Elite as well, so if they are told to sing to the Communist tune, they will do so……and yes you are probably right, there will be some for of legal fleecing of the general population by some law or regulation that will ensure the flow of cash to the banks…. The reality is that the elite (the puppet masters) control the masses (the puppets) and string them along to do their dirty work. But behind the scenes, the puppet masters do the exact opposite and reap the rewards of what they say they despise, while the puppets suffer the consequences. What you don’t understand is that your elite puppet masters are on strings too. They dance to false tunes of false ideas, They get short term results that look good according to their ideas. It does not end well for them nor the rest of us in the long run. If they would take the energy and effort they spend screwing everybody else and focus on creating value for honest trades, they could actually earn their living and abundantly so. If they can’t do that, why do we allow them to be the elite and screw us? Aren’t they exactly the same as the non-productive Nobles that we exiled so long ago? They prance and dance that they are so much better than the rest of us. They, like the Nobles, are nothing but thieves, thugs, and parasites with the blessing and backing of an out of control Government. Yes, our puppet masters are puppets themselves. They think they are so grand and in control but, way down deep where it really counts, they are frightened children terrified of things that go bump in their souls. Even as they project their hidden self onto everyone else. everything they do is to quiet that terrifying voice within. They are not to be pitted. They did it to themselves by accepting their false ideas without question or thought. Again, why do we allow them to be the elite and screw us? Just need to look at who is and was buying up coal stocks, companies and related things at depressed prices. Sort of like looking at who bought real estate very cheaply in the US after the ‘surprising’ crash of 2008. Maybe ask the PM, Goldman Sach’s man in Australia. Was it Soros who was buying up depressed coal mining shares/stocks? Look at the NAB announcement. How brave, they will continue with their current coal customers, and will be happy to fund coking coal. Just not thermal coal. So how many new big clients were they going to get, or is Adani the only new thing going? And the NAB are too scared twenty greens might turn up outside their branches and shut them for two hours. So Maggie Thatcher’s demonisation of coal to enable her to smash the Miner’s Union back in the 1980s has transmogrified and grown into this monster. Yes, it’s all Baroness Thatcher’s Fault. I think Sophocles that you have your dates wrong. Thatcher defeated Scargill, the obdurate coal miner’s leader (and not all miners followed him ) in 1984/5 . Her landmark speech to the UN about the dangers of climate change from CO2,( which as you rightly say prompted global political interest in a formerly academic topic) was not until 1989 by which time Scargill was a sick old man trying to con money out of his fellow miners. She was fighting Scargill 1984-1985. She had laid plans in depth well before then and Scargill walked head first into them. She was backing John Houghton and the CRU shortly after and particularly in 1988-1989 when Houghton was setting up the CRU. Her speech about Climate Change in 1989 was after she had been active with Houghton and his group, setting up the CRU and the IPCC which made her the first to broach the subject on the world stage but she could also be labelled the first sceptic, as she didn’t think it was so bad. She had laid plans ahead of time, knowing a confrontation with the Unions was inevitable after she became PM. knowing coal production was expensive and resources had become meagre. She was instrumental in coal users moving from coal to natural gas, knowing she was going to be `butting heads’ with Scargill. Scargill duly obliged. I’ve had a look through all my bookmarks (sheesh, time to simplify!!) but I couldn’t find my reference. I read it on-line very recently. Britain’s use of coal was pretty dirty and was part of the `acid rain’ problem. Electrical power generation using coal is among the greatest contributors to gaseous pollutions that are responsible for acidic rain. Thatcher was a chemist and knew the problem and it’s sources. I was referring to a line which, given her involvement with Houghton and with Scargill, was a useful political point to aid in the war against Scargill. Not much, if any, consideration was given to it at the time. It is worth quoting Margaret Thatcher’s own thoughts on the policy response to global warming. In her 1993 memoirs The Downing Street Years, she made this comment on page 641. The relationship between scientific research and policy towards the global environment was not just a technical matter. It went to the heart of what differentiated my approach from that of the socialists. For me, the economic progress, scientific advance and public debate which occur in free societies themselves offered the means to overcome threats to individual and collective wellbeing. For the socialist, each new discovery revealed a “problem” for which the repression of human activity by the state was the only “solution” and state-planned production targets must always take precedence. The scarred landscape, dying forests, poisoned rivers and sick children of the former communist states bear tragic testimony to which system worked better, both for people and the environment. Kevin, more great stuff. Your post at 1.1.1 needing a second (or third or more) accolade. Thatcher’s government was at war with Scargill’s Miners Union 1983/1984. Once that problem was solved Thatcher turned to another one. In the political background, Europe was making endless trouble about British pollution of fresh water, the beaches, the sea and the air. On the other hand, the idea that nations should resolve to curb their carbon dioxide emissions suited the United Kingdom exceptionally well, given the impending demise of the nation’s coal industry and the Prime Minister’s support for nuclear power. She set out to wrest the initiative in environment matters from the European Commission, by making the greenhouse warming a global issue with the British not just at the table but in the chair. The French and Dutch governments wanted to evolve a common European policy on greenhouse gases but the British environment minister vetoed that. Instead, the United Nations and its specialised agencies found the British becoming hyperactive in unaccustomed subjects and giving very practical support in creating the global apparatus of the Intergovernmental Panel on Climate Change. This was the height of Acid Rain pollution across Europe. The end of the Miner’s strike meant she could further this project silence the European Commisioners, and over the next few years she did just that with it culminating in her September 1988 address to The Royal Society. One point to remember: the gas and oil from the North Sea fields were at their highest level of exploitation over this period. Now I just have to track down the one line which is frustratingly staying hidden! Thatcher’s speech to Royal Society (climate): Sept, 1988. She didn’t demonize coal. She had a big fight with the bullying unions. Yes, locally with the UK’s National Union of Mine Workers and globally with the European Union. Most war is funded via economic control; buy always ends up a a arrogant political dominance attack over the lessers\producers\serfs, that are the basis for any economy! Round and round it goes. Do unto others, before they do unto you! So our gullible Australian politicians will try to stop the use of coal and oil, in accordance with the Paris Accord. Obviously they are incapable of thinking ahead. For starters how will the various members assemble in Canberra for each session? It is a long way from Perth in a windjammer, followed by the overland stage in an ox cart. And how many will relish Canberra in winter with no heating? Then they will have to explain to the public that they will strictly adhere to a “Treaty” which only penalises a few countries, because they wish to make a token gesture in reducing emissions in response to an unproven assertion that CO2 causes global warming, and an equally unproven assertion that continued use of fossil fuels might result in ‘dangerous’ temperatures last seen about 3,000 years ago. They will then claim that regular (and irregular) blackouts, along with higher prices when electricity is available, along with higher unemployment are a necessary sacrifice while 90% of the World ignores the ban. And what happens when the level of CO2 passes 450 ppm. and the climate is no warmer, even cooler? And that is one of this nations problems, politicians who have no vision beyond the next election. I think the prediction of coming fuel riots will focus their tiny minds….. The problem is that there is a miniscule number of politicians around the world that are capable of thinking but even then they do as they are told rather than actually thinking. If all the vague policy proposals are fully implemented in accordance with the Paris Accord (which is unlikely) global emissions will still be increasing in 2030, whilst the policy objectives are for them to be decreasing rapidly. UNEP produced an Emissions Gap Report for COP23 in Bonn last month. Figure E5.2 illustrates the huge emissions gap, which was not closed in the conference. This is nothing new. The Adoption proposal of the Paris Agreement, section II, point 17 notes expresses the emissions gap into words. Section 21 is basically an instruction to the IPCC to think up more scary stories so that more nations will sign up to emissions reduction policies. It has not worked, but in Australia the climate bandwagon continues regardless. And then there’s this for heaven’s sake! The Australian seems to have been taken over by the nit-wits. I want to reduce my subs, because I can read drivel like that on the ABC site for free. “Free” as in Medicare is “free” and Education is “free”. I suppose if I pay my electricity bill in advance, that is “free” too. You could start a new trend: User is Paid instead of User Pays. They pay us to read their drivel, instead. I could go along with that … for a short while. In figure 1, Mtoe is million tonnes of oil equivalent. Note Australia tops one list – biggest coal exporter at 389 million tonnes, followed by Indonesia 367 Mt, total world production 7269 Mt (page 17). Australia has 4.4 GW of installed wind turbines that doesn’t rate a mention, just 1% of the world’s 414 GW (page 23). Australia does come in at #10 on solar capacity with 4.4 GW, world 220 GW (page 25). Surprisingly, Australia is #4 in oil product imports, a sad reflection on the decline in oil production and refining (page 27). The world’s energy production (page 47) is 13,790 Mtoe with oil providing 32%, coal 28%, gas 22%, biofuels and waste 10%, nuclear 5%, hydro 2.4%, and wind/solar just 1.5%. That really tells the story of how little impact the UN and the IPCC have had in changing energy use. Australia’s CO2 emissions are 1% of world total (page 60) so all our efforts are really going to save the world (not). Thanks for nothing, pollies. Apart from housing loans who are Australian banks going to lend money to since industry is shutting down and our main viable and certain export that everyone wants is coal. Looking at these graphs, how can fossil fuels be replaced by any known non-CO2 producing product without a massive down turn in the worldwide standard of living, when even with the current use of fossil fuels, so many people are lacking in basic amenities? There is just no known effective alternative that can meet current needs, let alone predicted and necessary growth! This is proof that those who hate coal so much they are acting in a way to move away from it completely are in effect economic terrorists. Why aren’t they treated as such? If someone went about trying to destroy our banking systems or stock exchanges, they would be put behind bars in a flash. I say just stop using all fossil fuel right now! Seriously shut down all coal plants, mines, oil drilling , pumping, exploration and refining. Lets see how that goes. I read somewhere that if everyone in Australia didn’t get fuel on any one day the price would plummet ,something to do with storage space I think . Life as we currently enjoy it in the supposedly civilised countries would just grind to a complete halt. The people who wish this on us are either very stupid or very evil. They have massive information sources at their disposal, so ignorance is not possible. Evil mongrels for 20, please quizmaster…. Works for me … let’s stick with it. Admittedly, it’s not quite correct but we could take a leaf from the Gractivist’s book and ignore Facts …. for once. Being stupid and being evil are not mutually exclusive. Assume they are both, and then be very afraid. I was tempted to say just that Rereke. Well I’d be even more afraid of they were clever and evil. There seems a plethora of those also. Oh whoa are we! I do wish people would come out from the latte belts and learn about mining, and what it provides to Australia and the world. We invest in mining among other businesses, our kids work in mining and related operations that rely on mining for much of their custom. They earn high-end incomes, and very much prefer to be out there than in a capital city office. Just saying, some people should open their minds to a whole spectrum rather than keeping to narrow ideology. My reply below, at #15, was meant to go here. I note from the graph that the biggest “fossil fuel consumers”, ie USA, China, Russia & Japan are all “Economic Powerhouses” and are likely to continue on that path. As for the EU, Canada, Oz etc – oh dear. I note India has a fair amount of Renewables – is this hydro? Slightly OT but Australia’s greenhouse emissions are up by 0.7% , you all should be ashamed of yourselves and I want to see a 100% increase or I will bring on permanent winter . I agree, and was pleasantly surprised this in the SMH’s “Latest News” this morning. That it was published at all was one of the surprises, but that it was in SMH amazed me. Perhaps there is some hope after all. It’s probably worth pointing out that the graphs shown here drastically understate the growth in coal. TFEC only accounts for coal that was used for final consumption, i.e. burned as a final energy source (blast furnace, industrial processes, cooking if anyone has coal fired stoves, etc). It doesn’t count coal that is transformed into another energy form before final consumption, say, for example, in a coal fired power station. MTOE – million tonnes oil equivalent. jo has a go at “carbon capture” – well worth reading the following recent, first-hand account from China, albeit in a series of CAGW-infested articles by Akshat Rathi, in a series called “The Race to Zero Emissions”. Quartz bio: Quartz: Akshat Rathi is a reporter for Quartz in London. He has previously worked at The Economist and The Conversation. His writing has appeared in Nature, The Guardian and The Hindu. He has a PhD in chemistry from Oxford University and a BTech in chemical engineering from the Institute of Chemical Technology, Mumbai. While the construction rate of new coal-fired power plants has slowed, it hasn’t stopped altogether. Further, even if China stopped building new coal plants tomorrow, the country has come to so deeply rely on this dirtiest of fossil fuels—more than 70% of its electricity currently comes from coal, compared to about 40% in the US—that it would continue to emit significant greenhouse gases for years to come. China’s energy demand is so high right now that it simply cannot afford to stop burning coal and other fossil fuels. Now, Roy Green, chairman of the Port of Newcastle in Australia, the world’s biggest coal port, has said (paywall) that the port is preparing for a world without coal. In 2016, coal accounted for 96% of trade at the port, which is mined in the nearby Hunter Valley region. The port is hoping to diversify into non-energy sectors, such as a container port to import and export high-value products, and maybe even a cruise terminal to attract tourists. Yes, that’ll do it. Replace coal exports with “high-value products.” Like what, exactly? Maybe Australia could make the Aphone and ship tons of them to China? Across the government, career staffers are finding ways to continue old policies, sometimes just by renaming a project. In report after report following Donald Trump’s election, career staffers at the National Oceanic and Atmospheric Administration kept saying the same thing: climate change is real, serious and man-made. I really am puzzled at times, and I wonder what will happen when the real truth does come out. I’m not really concerned about what people think of coal fired power, because sooner or later, that truth will come out. Coal fired power is actually indispensable, even here in Australia, and that was highlighted only yesterday. At the moment there are only three coal fired Units across the whole of the three States which still have coal fired power in the AEMO coverage are, and that’s three out of a total of only 49 of them at 16 power plants. The Peak power yesterday was just on 30,000MW and coal fired power was delivering 20,000MW of that, and think about that for a minute. There were three Units off line so that takes away 1720MW from the total of 23,020MW, so those remaining 46 Units at those 16 power plants were delivering their power at a Capacity Factor of 89.7%, so just a tick under 90%, so basically, considering that they lose a little of their total Nameplate power over the years of constant operation, all those remaining units were operating almost flat out at their maximum power generation. While in NSW and Qld, those coal fired Units follow the Load Profile, Victoria is the most stressed, and with one Unit off line, only one Unit out of 10, those remaining 9 Units are delivering at their maximum,virtually 24 hours of every day. Now, why yesterday was so indicative of how important coal fired power really is here in Australia, it wasn’t just that total power delivery at peak Power time, it was highlighted in stark reality when one of the Units at Eraring in NSW went off line, and that was at 5.30PM. This wasn’t a staged shutdown where it rolls slowly back to zero, and other plants are already in play to make up for that slow rollback. No, this was a sudden shut down, from 700MW back to zero, immediately. That took a vital 700MW out of the system, just when it was needed the most. Because of that, the cost of power immediately spiked, and it wasn’t just a short spike. Immediately, a whole raft of smaller gas fired plants had to be brought on line, and that wasn’t just in NSW, because it happened, at that same time in four States, NSW, Qld, Vic, and Tasmania, now having to ramp up Hydro to deliver into Victoria, so some of Victoria’s power could be diverted into NSW, and Qld also ramped up to supply extra into NSW as well, and NSW brought on line some of its gas fired plants, so just to make up for that missing 700MW, those three other States had to supply a little extra. Because of that, the cost of power doubled in those four States, not just spiked but doubled for an hour until it settled back down again. That Unit at Eraring was off line for just a tick under four hours, and when it did come back online, it was only incremental in steps, and even now, 15 hours later, it’s still only back to 400MW of its 720MW. Now, why I mention this is that if you take away not just ONE Unit, but whole power plants, like say, Liddell in NSW, Yallourn in Victoria and whatever is ‘thought bubbled’ for Qld, then Australia will, quite literally just crash and burn. That’s not just 720MW, but around 3500MW, five times what happened yesterday. Now, THAT is the truth I’m talking about right at the start of my comment. Pretty soon now, someone in politics is going to have to ‘bite the bullet’ and actually come out and say that. It’ll only take one of them, because as soon as he does, all the others will go and check, just to gain some political points by proving him wrong, and then, slowly, they’ll all realise how right he really was in the first place. Coal fired power is absolutely vital, and whatever other word I could use to emphasise it, and until that truth comes out, the public will blindly just nod their heads in agreement with the $hit stirring greenie vandals. Pity help those politicians when that time does come, when the public backlash about not being told the truth will come home to roost. It’s actually closer than you might think. Incidentally, power consumption at 4AM this morning, the Base Load was 20,000MW PLUS, first time I have ever seen that.So, while nearly everyone in Australia was sound asleep, greenies included, power consumption was around two thirds of virtually every watt of power able to be generated in Australia. Tell me now that coal fired power is on the way out. Pshaw! thanks for the info as usual. The company has published a 22-page report outlining key climate and energy policy differences between it and several of the lobby groups it is a member of. The review has found material differences between BHP’s position and the position of the Minerals Council of Australia (MCA), the US Chamber of Commerce and the World Coal Association (WCA). BHP said it has reached a preliminary view to exit the WCA, with a final decision due by the end of March. The company said it is also considering its future as part of the US Chamber of Commerce, again with a decision due by the end of March. BHP has indicated its desire to remain part of the MCA “given the high level of benefit BHP derives from membership”, but the company has said it will request the MCA refrain from policy activity and advocacy in these areas of difference on climate and energy policy. BHP has identified two main differences with the MCA on climate and energy policy. The first is the MCA’s argument that energy policy should prioritise reliability and affordability over other policy goals — BHP said it believes climate and energy policy are “inextricably linked” and “should be considered on an integrated basis”. The second major difference is the MCA’s advocacy for policy changes that would favour so-called High-Efficiency Low-Emissions (HELE) coal power stations and a new coal-fired power plant in the La Trobe Valley. Such a move would be a massive blow to Australia’s peak mining lobby group — not only would it lose credibility if the nation’s, and world’s, biggest miner pulled out, but BHP’s annual subscription fee of $1.86 million accounted for around 17 per cent of the MCA’s revenue last year. One of the organisations that had pushed BHP to ditch its MCA membership over climate issues, the Australasian Centre for Corporate Responsibility, said it welcomed the company’s “extraordinary” decision to leave the WCA, but feels it could have gone further. “This is a message that even organisations, like BHP, with large coal assets, do not value aggressive anti-climate lobbying,” ACCR executive director Brynn O’Brien said. “However, BHP’s equivocation in relation to membership of the MCA, in giving the MCA another 12 months to change its tune on coal, points to the highly-charged environment in which climate policy is made in Australia. Never mind. Our Green Betters will wait for a moonless night and slip ashore with more diesel generators. The containers can have the words SUBMARINE PARTS on them. The diesel consumed will be exempt from carbon auditing because…because…because it’s special, okay! When the cost of diesel soars it’ll probably just be because there’s a war. So then we conquer Russia and Iran by threatening them with our 2090 (est) submarine power…and the diesel flows again. The War on Coal was never going to be easy. Nor was it ever going to make the least bit of sense. Nor was it going to bring any benefit to anybody except arms manufacturers, oil merchants and green carpetbaggers (if there’s a difference). …. Last Thursday, one of the biggest coal units in Australia, Loy Yang A 3, tripped without warning at 1.59am, with the sudden loss of 560MW and causing a slump in frequency on the network. Data from AEMO (and gathered above by Dylan McConnell from the Climate and Energy College) shows that the Tesla big battery responded four seconds ahead of the generator contracted at that time to provide FCAS (frequency control and ancillary services), the Gladstone coal generator in Queensland. 7.3 MW to “help”. And a whole four seconds before the major generator! Oh those stunned industry insiders! Pass them the smelling salts. I wonder if Elon hired the usual team of NIDA students and barista trainees to celebrate with lots of hugs and high-fives. Nah, probably not. We would have seen it on what some still call – for mystifying reasons – the news. Interesting debate going on over there at RE about this article. Much reasoned criticism , technical input, wild claims, etc etc and of course the normal fingers in ears reaction from the faithful. ! …highlighting the intermittent and unreliable nature of coal generators …. For purposes of promotion, bio-waste/fuel and hydro are lumped with wind, solar and the rest of the peashooters. But you never see a pig-poo digester or dam spillway when the luvvies are talking about their “renewables”. It’s always an array of wind turbines or solar panels under happy skies. So there’s no first place and only the nice children get medals. It’s the same medal to all: FOR EFFORT. I knew this modern education system would come in handy some day. One of the major threats to (IS?) the reliable supply of coal fired power generation, according to the report, and one of the most likely potential triggers of a major electricity outage over the coming months. Already, four coal units have tripped in the last week as the first heatwave hit the eastern states. The report, published by Energy Networks Australia on Monday and building on the Gas Vision 2050 report, says that Australia’s current gas network could be decarbonised by 2050, through a combination of renewables generated hydrogen fuel, waste to energy biogas, and carbon capture and storage technology. In particular, the report talks up the potential of using Australia’s vast solar and wind resource to produce hydrogen fuels, that could be injected into existing gas networks; used for industrial heating, space heating and cooking; and to mop up and store excess renewable energy generation. Just shut the d@mned things down. Yep! Problem solved in under ONE HOUR, in fact it’ll start within seconds. The rest of the time will be synching them all back onto the grid. That’s the last you’ll hear of this CO2 fiasco. Ever. Three States only with coal fired power, Qld, Vic, and NSW. In a discussion paper (LINK) released on Tuesday in the first step of putting together an Integrated System Plan (ISP) by the middle of 2018, AEMO says the future grid will be dominated by wind, solar, and battery and other storage, and it time to put together a co-ordinated plan. Why do Australians hate cheap energy so much? We like to kid ourselves that the world cares or notices what we do. Specifically — our foreign minister and PM get better dinner invitations when we pay more for electricity. As far as the World Bank is concerned, electricity generators are a tradable commodity, because they tend to be monopolies or monopolistic, which guarantees profit and extortion opportunities to their potential future owners. Before they’re traded, they have to show a good line of consumer extortion, ie higher than necessary prices, and good solid plundering. SMITH, J. W, “Economic Democracy, the Political Struggle of the Twenty-First Century“, 1930- updated and expanded, 2nd Edition © 2002, ISBN: 1403324085 [paperback], 1403324093[hardcover]. We can see clearly now, thanks to the persistence of Junkscience.com, that while visible pollution may be ugly and unpleasant, that its negative health effects are far less worse than the benefits of having affordable energy sources available. New Delhi: The country is expected to achieve the coal production of 1.5 billion tonne by 2022, Coal Secretary Susheel Kumar said on Monday. Of the 1.5 billion tonne, 1 billion tonne would be contributed by Coal India and the rest by private producers and Singareni Collieries, the official said. Seasonal demand may still sustain the current rally throughout winter, said Georgi Slavov, head of energy, ferrous metals and agricultural research at London-based commodities broker Marex Spectron, who cited low inventories in Asia and Europe. An increased availability of short-term credit has allowed buyers in China and India to further ramp up demand in the past four weeks, he said. China’s coal output in November hit its highest since June at 299.98 million tonnes, data showed on Thursday, boosted by firm demand from coal-fired power plants as the country’s heating season kicked off in the middle of the month. But supplies have not been able to keep up with the extra consumption. The nation’s capital city Beijing will restart a coal-fired power plant to help ease the deepening gas supply crunch. Coal is not only the main source of fuel for power stations and industry, accounting for about two-thirds of China’s electricity generation, it is also burnt to heat millions of households through Northern China. So when officials imposed their ban on coal use in line with Xi’s concern for the environment, they triggered a price surge and supply squeeze in substitute clean energy, notably natural gas. And millions of poorer households and many towns and villages unconnected to the gas supply grid were left out in the cold. Over the past couple of months, natural gas prices have jumped by 70 per cent, hurting energy-intensive businesses, many of which were already operating on razor thin margins. Some have been forced to shut down. That’s bad enough, but even more embarrassing as far as government officials are concerned, are the tales of personal hardship that have spread across the internet and through the media, complete with stories about schoolchildren suffering frostbite because of the lack of heating in their classrooms. In response, the government has been back-pedalling frantically. On Wednesday, Mohurd, China’s Ministry of Housing and Urban-Rural Development, ordered local governments to revert to coal-burning where supplies of natural gas are short or unavailable and to make sure that households have sufficient fuel supplies for heating. As long as Beijing continues to govern by diktat, attempting to manage the supply side of the economy in order to hit arbitrary and often impractical targets, it will continue to encounter similar difficulties. A more sensible solution would be to forswear direct intervention and instead allow natural demand to do its work within the framework of a predictably regulated market. China has made admirable progress along these lines in other areas. But when it came to tackling pollution, eco-warrior Xi and his party drones were in too much of a hurry, reverted to central planning type, and duly messed things up. Hopefully they will see things more clearly in the future. Indian firms including aluminum smelters and chemical factories are considering importing more coal to ease fuel shortages as most of the country’s output is diverted to electricity generators. Coal India, which accounts for more than 80 percent of the nation’s production, has had to divert most of its supplies to power plants to prevent outages, causing shortages for other customers. As a result, power costs for other users have increased by an average of 50 percent, Sharma said. Thermal coal at the Australian port of Newcastle, an Asia-Pacific benchmark, is trading near $100 a ton after gaining about 17 percent in the financial year that started in April. Coal India’s shipments to power plants rose 9.2 percent to 290.6 million metric tons in the eight months ended Nov. 30, the company said. That accounted for 79 percent of the overall supplies of 368 million tons during the period. While stockpiles at power stations have started rising, non-power customers have had to resort to costlier imports of the fuel. India’s coal imports rose 48 percent to 2.62 million tons during the week ended Dec. 11, according to Global Ports data compiled by Bloomberg. Hot weather in eastern Australia has electricity demand climbing above 30,000 MW this afternoon so those coal stations are working hard. But the wind is also blowing strongly so wind is delivering 2,800 MW (from nameplate 4,400). But I’m puzzled by the SA 30 minute price dropping to $5/MWhr while in Vic the price is $125/MWhr with similar prices in NSW and Tas. Why do SA generators need to bid so low? In SA with demand 1200 MW, wind is supplying 950 MW and gas 870 MW, so exports to Vic are 620 MW (I think about max capacity on the connector). But why are the SA gas generators running so hard for so little income? In the next couple of hours, prices in Vic/NSW are forecast to jump to $270 as temperatures rise and a/c’s are switched on, and SA prices lift to above $100. SA’s big battery is contributing 25 MW for 10-20 minutes at a time. Are they trying to smooth the flow of wind generation? So I fill in a form, do not list father, but tell 7.30 Report ABC about meeting him a number of times, even explaining that at one meeting his son and daughter came with him and Anthony thought here in the room are my four closest blood relatives, Carlos my father and my half sister and brother with my own son. In 2013 I told PM Rudd that I might have to leave the election campaign to go to my father Carlos who was dying. But in 2017 (and on earlier documents) I filled in “father” as unknown. “The mainstream media reported Sunday and Monday that President Donald Trump’s new National Security Strategy (NSS) would remove climate change from a list of threats to national security. Pathetic anti-coal pro-Big Battery propaganda! So 7.3MW from a battery “replaces” 560MW of thermal power generation? The following is based on information provided by AusNet Services, as operator of LYPS. At 1116 hrs on 31 May 2017, LYPS No.1 and No.3 500kV busbars tripped via protection. A trip signal was initiated from the LYPS A generating unit 3 as part of the planned trip test. Information obtained from the relevant protection relay of the A3 Gen Trans No1 Bus 500 kV CB indicated that after receipt the trip signal, the A3 Gen Trans No1 Bus 500 kV CB “R” phase opened within 30 ms; “B” phase opened in 227.75 ms and “W” phase opened in 596.31 ms. Correct CB operation would be expected to have all three phases opened in the order of 40 ms of receipt of the trip signal. trip. Operation of the CB Fail protection was a correct outcome for this type of fault, and the CB Fail protection operated correctly to trip the No1-No3 500 kV busbar. The A3 Generator No.1 bus 500 kV CB was isolated pending further investigation. The No1 and No3 500 kV busbars were returned to service at 1202 hrs on 31 May. Since the 16th June 2016 incident when the A3 Generator No.1 bus 500 kV CB had failed to open correctly, the CB had operated correctly on three occasions earlier in May 2017. Following the incident on 31 May 2017, timing tests were carried out on each of the three CB operating mechanisms using both “X” and “Y” trip coils. The CB operation and timing tests were found to be satisfactory. As the root cause of the slow operation of the A3 Gen 1B 500 kV CB was not found, AusNet replaced the hydraulic operating mechanism on all three phases of the CB. On completion of this work and satisfactory testing, the CB was returned to service on 13 July 2017. So back in May, the fault wasn’t with the power generation per sé, it was with the switchgear. The derided “big, lumbering power plant” kept spinning. The following is based on information provided by AGL, as operator of LYPS-A. … The unit was generating 450 MW at the time of the trip, and this loss of generation was expected. … The generating unit remained energised and at synchronous speed until it was re-synchronised to the No.1 busbar at 1220 hrs on 31 May. I’d venture that this trip was another planned trip test; and another CB fault detected. With “loss of generation expected” and there being sufficient on-demand generating capacity available to fill any anticipated loss. Yeah, the thumb’s on the scales.